One of the most beautiful firs on earth. Abies nordmanniana, the Nordmann Fir, is native to the mountains west and east of the Black Sea, in Turkey, Georgia, Russian Caucasus and northern parts of Armenia. It occurs at altitudes of 2,500-7,000 feet on mountains with a rainfall of over 40 inches per year (Maryland gets around 45). It is a large evergreen coniferous tree growing up to to 60 m (195') tall and with a trunk diameter of up to 2 m (6.5') . In the Western Caucasus Reserve, some specimens have been reported to be 78 m and even 85 m (280') tall, the tallest trees in Europe. In a persons lifetime it can be expected to grow to 40 feet tall when planted a 3' height. The leaves are needle-like, flattened, 1.8-3.5 cm long and 2 mm wide by 0.5 mm thick, glossy dark green above, and with two blue-white bands of stomata below. The tip of the leaf is usually blunt, often slightly notched at the tip, but can be pointed, particularly on strong-growing shoots on young trees. The cones are 10-20 cm long and 4-5 cm broad, with about 150-200 scales, each scale with an exserted bract and two winged seeds; they disintegrate when mature to release the seeds. 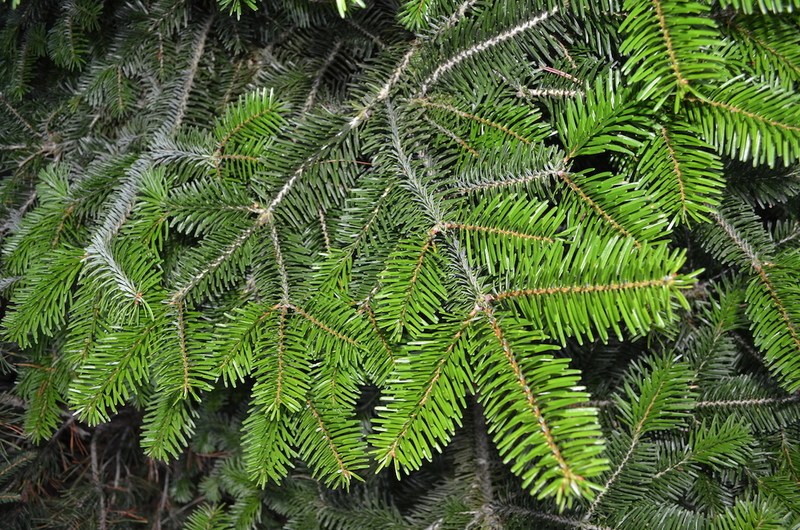 Nordmann Fir is one of the most important species grown for Christmas trees, being favoured for its attractive foliage, with needles that are not sharp, and do not drop readily when the tree dries out. It is also a popular ornamental tree in parks and large gardens.